Business Process Model and Notation, BPMN for short, allows you to visualize the process model. A process model, written in BPMN, is an XML file at its heart. This XML format is well defined and maintained by the Object Management Group. This XML is deigned for portability, to be executable, and is currently the leading industry standard format (ISO/IEC 19510:2013). Business Process Management Suites (BPMS) and other tools use this to exchange processes. This means that most of these tools can read and or generate BPMN. Read how OTRS is leveraging this standard. When designing a process, it should be clear to business users what is happening. This means the tasks involved and the performers are graphically represented. BPMN 2.0 has an entire library of standardized visual elements and terminology which OTRS leverages now to better conform to this standard. BPMN describes the following two objects (narrowing it down a bit ;)) which OTRS is has adopted. Automation of the workflow takes place in the transition and transition actions. So far no big change. We see now that OTRS uses the standard names for two elements vs. re-inventing the wheel. This makes it easier for your business team to talk with the OTRS administrators and makes integration tasks much easier. The real magic comes when we create a Task. A Task in ((OTRS)) Community Edition is always a User Task. 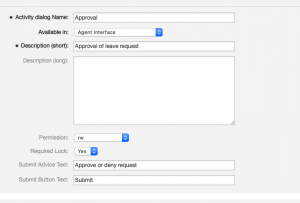 A Task in OTRS can be a User, Script, or Service Task. This means, that you can now visualize all of the elements of automation within the process manager canvas. 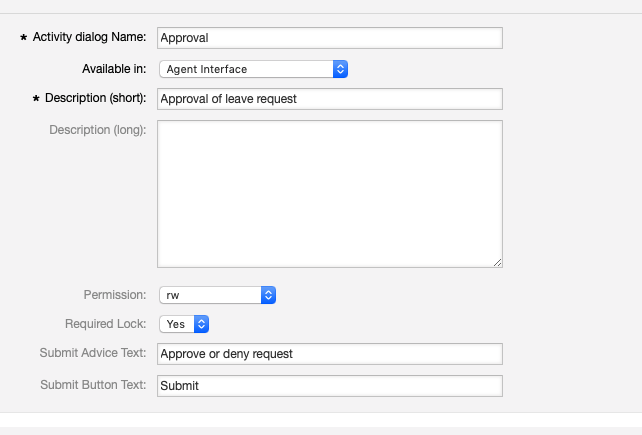 Based on the user input of any Task, the Sequence Flow will determine the next Task. Changes in ticket data done via a Script Task (or specially programmed functions like Sending an Email), or calls to foreign systems via a Service Task, are not only presented to the process designer for ease and speed of design and troubleshooting, but notification of such tasks are now seen by agents when the system is performing them, or during errors. A fully visual process, only with OTRS. We still have some tool specifics which we will be adapting to support the standard better in the future, but for now: Service Desk Management Automation has never been easier and more compliant that with OTRS.